I love those brasseries and cafés that have withstood time and kept intact interior architecture and decorations. When walking in, it’s kind of a multisensory experience, a journey into the past, but also inside the place and the plate. We also fancy dressing up for the occasion, as if to celebrate the beauty of the place and the talent of these artists-craftsmen of times gone by. We visited the city of Nantes, Western France in the rain, with a few calm spells from times to times. But all day, the sky was one with the slightly marbled light grey of Nantes’ City Centre’s old buildings. 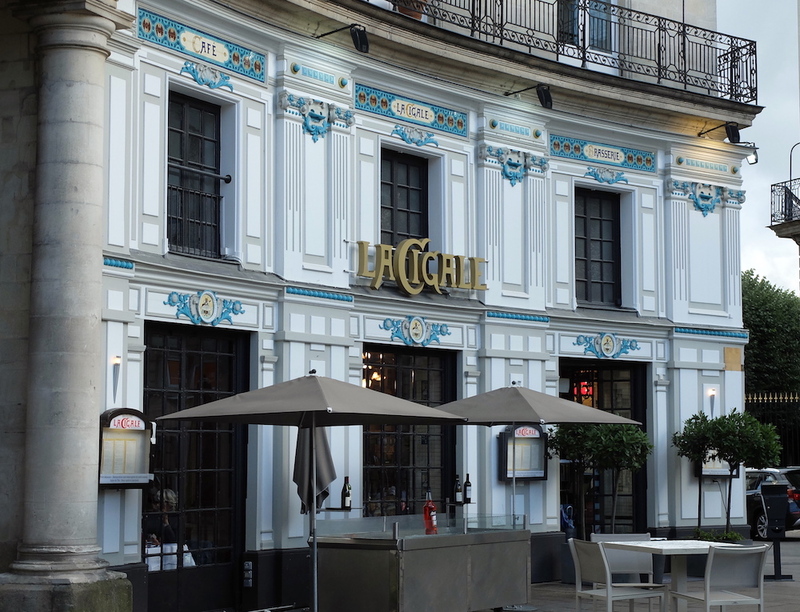 Once on Place Graslin, the elegant white and blue facade of La Cigale Brasserie caught our eyes. And we had barely stepped in that we decided to have breakfast there the next morning. La Cigale Brasserie faces the Théâtre Graslin (theatre and opera house). Classified as a historical monument since 1964, it has kept its decorations in the Art Nouveau style, with breathtaking interiors covered with ceramics and decorated with statues, paintings and mirrors. La Cigale Brasserie was designed by Émile Libaudière, architect and ceramicist from Nantes (1853-1923), and decorated by sculptor Émile Gaucher and painter Georges Levreau. La Cigale Brasserie opened for business in 1895 and immediately attracted a bourgeois clientele along with with local artists. Later, Surrealist artists such as the French poets and writers Jacques Prévert and André Breton, came regularly. Several films have been shot there, including Lola by the French Director Jacques Demy. If it has almost been abandoned in the 70’s, La Cigale is today an emblematic place in Nantes, and we can understand why. I’m not going to lie to you! Since we have expatriated out of France, we catch ourselves craving for some French food. Sometimes, it’s somewhat ridiculous or at least it doesn’t look like anything we craved for when we lived there. I could write verses about French food, but for now I will just make a confidence: lastly, I have been craving for viennoiseries and brioche. Oh! By the way, let me tell you once for all: French people don’t eat viennoiserie every morning. (Thank goodness!) But, oddly enough, I was dreaming of crunchy, buttery and fresh viennoiseries. I have even found one of the best places that make decent croissants in the whole Copenhagen. And last time I went back to France, I went bus station-bakery-hairdresser, and I “gobbled” down my pain au chocolat with joy in front of the mirror, with a robe on and wet hair. The strong smell of the hair mousse didn’t even ruin my enjoyment. I was happy. But I’m getting carried away. At La Cigale, we ordered the breakfast menu that could make any foreign tourists who would take a look at our table turn diabetic: mini croissants and pains au chocolat, fresh bread, salted butter and homemade jams, fresh orange juice, and to top it all off, a true Valrhona hot chocolate. Amazing! Everything was excellent, served on a white tablecloth by waiters wearing a bow tie and a black vest. A delicious moment. Open everyday from 7:30 am to 00:30 am.